I hope everyone had a lovely Christmas! I always love the weeks and days before Christmas as the excitement builds. It tends to get a bit chaotic- but I still love it! Despite encouraging my lovely customers and friends to make an early start on Christmas cards I never seem to take my own advice. So with only about a week before Christmas I commenced my cards and managed to get them posted or hand delivered before Christmas! Phew! I didn’t make as many as I had hoped but I gave it my best shot and here it is……. When I sat down to design my card I realised I didn’t have enough of the traditional Christmas colours I would normally use. I had planned to convert the photo to black and white and use some of the lovely Cherry Cobbler I love so much. As I didn’t have enough time to order some more cardstock I decided to print the photo in colour and use the colours in the photos as the inspiration for my Christmas card. Therefore the main colours were Old olive, Rose red and Baja breeze. Given that my daughter was wearing pink it was a great opportunity to whip out my Melon Mambo Stampin’ emboss powder and emboss directly onto the old olive cardstock. I even mixed in a bit of iridescent ice for a bit of sparkle. 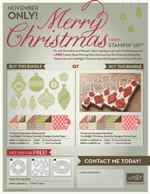 You can find the iridescent ice and melon mambo Stampin emboss powder on page 15 of the the summer mini catalogue. I am determined to make a start on my Christmas cards a little earlier this year 🙂 Hmm I think I said that after Christmas 2010 too!